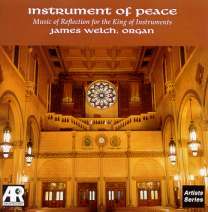 This album was recorded on the magnificent organ in historic Saint Paul's Church, Augusta, Georgia. The Casavant organ (Opus 2900) was installed in 1966 as the fifth organ built for the church. It was completely restored and rebuilt by Casavant in 1996. Keith Shafer, a native of Connecticut, received his education at the Hartt College of Music at the University of Hartford; the College-Conservatory of Music at the University of Cincinnati; and the Meadows School of the Arts at Southern Methodist University in Dallas, Texas. He has been a finalist in all of the major American organ playing competitions and has appeared in concert throughout the United States. Since 1983 he has been Director of Music and Organist of historic St. Paul's Church in Augusta, Georgia. His music program there is recognized as one of the most innovative in the Episcopal Church, with an annual attendance of more than 10,000 music lovers for Tuesday's Music Live, the most successful noontime concert series in America. Mr. Shafer has made a number of recordings and CDs which have been heard on the National Public Radio program Pipedreams, Georgia Public Radio's Performance Showcase, and on South Carolina Public Radio. 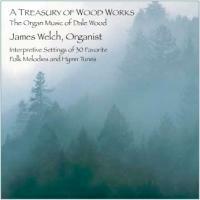 James Welch performs internationally as a concert organist. He has taught at Santa Clara University and the University of California, Santa Barbara. His doctorate in music is from Stanford University, where he studied with Herbert Nanney. Additional studies have been with Josef Doppelbauer at the Mozarteum in Salzburg, Austria; Jean Langlais in Paris, France; Alexander Schreiner, Salt Lake City, Utah; and John Walker. He serves as organist for St. Mark's Episcopal Church, The Church of Jesus Christ of Latter-day Saints, and Second Church of Christ, Scientist, in Palo Alto, California. "From the first time I came upon Dale Wood's organ music, I have admired his genius for choosing memorable tunes and giving them such imaginative arrangements. 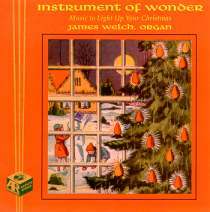 I have included a number of my favorite compositions by Dale Wood on previous recordings, including Instrument of Peace, Instrument of Wonder (a Christmas collection), and Around the World in Under 80 Minutes. Considering the wealth of material in his recent publications, I determined that it was time to devote an entire CD to this delightful music. "What is so captivating about Dale Wood's music? First, in his own themes as well as in his arrangements, he draws from such disparate sources as early American hymns, Victorian hymns, contemporary hymns, gospel songs, spirituals, international folk tunes, and even baroque chorales. Then he infuses into each setting his own joyful rhythmic style and rich harmonic language: some pieces sparkle and dance, while others luxuriate in romantic sound. He sets some hymns in the full gospel style, but just as easily gives majestic hymns a vibrant treatment. Modal tunes from the Old World take on new life; some of his original melodies sound uncannily like ancient folk tunes. 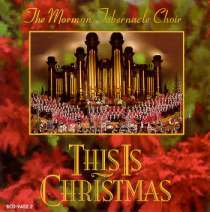 Dale Wood's original Carol From an Irish Cabin is featured on this superb Christmas album from The Mormon Tabernacle Choir. 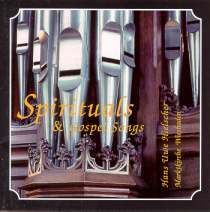 The organ in the Marktkirche, Wiesbaden, is heard in Hans Uwe Hielscher's album. 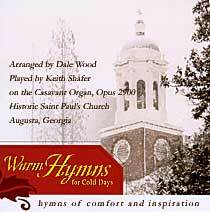 Three of Dale Wood's settings from his Softly and Tenderly organ collections of Gospel hymns are included. 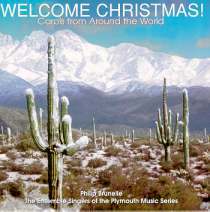 The Ensemble Singers of the Plymouth Music Series, conducted by Philip Brunelle, present Christmas carols from around the world. The sparkling arrangement by Dale Wood of the traditional Sussex Carol is featured.